Let's Get Real. Men's Suicide Awareness. November 17, 2017 -- Let's Get Real. Men's Suicide Awareness. 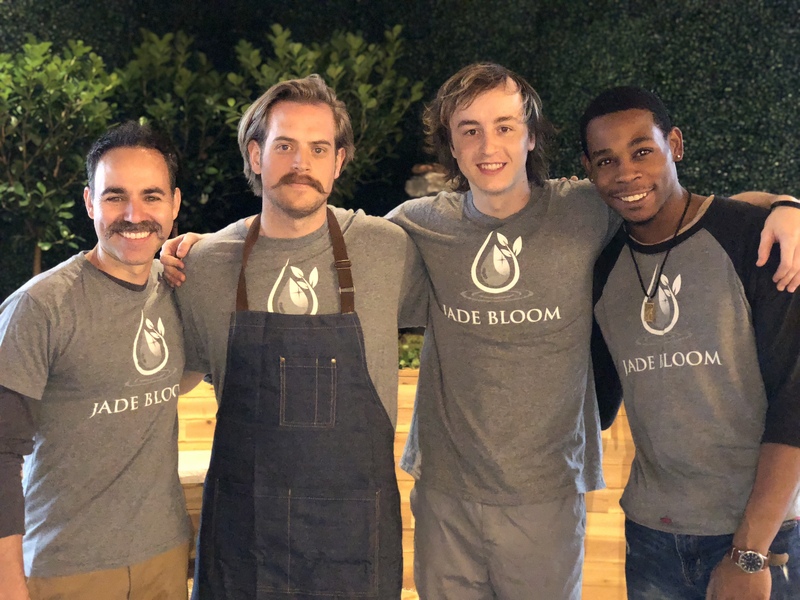 Look at these awesome Movember mustaches by the men of Jade Bloom. Taylor, have you really not shaved in a month? You have to look close, but it is there. Adam here. I am really excited to be writing the second of four blog posts this month with the focus being on men’s health topics. This post is in regard to an issue that I relate to deeply, and believe is not talked about nearly enough, especially among men. About five years ago I was going through an addiction that slowly dismantled my entire life. I was unemployed, irresponsible, depressed, and recently married. Not a combination that yields positive results. All of my time, energy, and money went towards feeding an addiction that perpetuated my self-loathing state of mind. Over the course of just a few years, I stole thousands of dollars from my wife and reached a low-point that presented me with only one feasible option, to end my life. This point came along after years of mental instability and finding my identity on how others identified me, which resulted in a suicide attempt at 14. Looking back, this was a cry for help, and I can say now that I did not want to die, I simply wanted people to notice me. I was able to break my silence and reach out to friends and family to seek help, and I am now going on my 5th year of sobriety, and have a restored marriage, thanks to a community of people who love me and were for me. I can resort to these types of feelings from time to time, but I am now equipped with the tools to help me see the truth; that I am loved, important, and worth something. Mental illness is an epidemic that affects the world over, but we see it more often in men. Over 1 million people commit suicide every year, and 750,000 of those people are men. Every second, a man commits suicide. This can be due to a myriad of reasons, each unique to the person, but having gone through depression, thoughts of suicide, and an attempted suicide, I feel that this among other things, is caused by unhealthy thinking and a fear of reaching out to the people around me for help. When you’re in this state of mind, it’s normal to feel like you are the cause of other people's problems, so coming forward and explaining that you are having suicidal thoughts, feels like yet another burden you are putting on others. Men report to feeling that they are only “allowed” to have 3 emotions. Anger, fear, and pride. While women are “allowed” to feel love, compassion, sadness, happiness etc. No wonder women are typically more mentally stable than men. We have created a culture that pigeon holds men into several stereotypes. I will highlight two of the most common stereotypes that I see in our world today. A man should be aggressive, intimidating, stoic, quiet and generally unresponsive to emotion. Any emotion you feel that is in any way associated with what some would say “women’s emotions” is to be swiftly cut down. You can be angry, and prideful, but never compassionate, self-aware, or open with your feelings. This makes you less of a man. You can see this stereotype find its way into movies, television shows, and commercials for products directed towards men. We’ve all seen the commercials that say that men should fight bears, tear down trees with their bare hands, eat raw meat, ignore their families when “the game is on” etc. I find it odd that our culture has decided that this is how men should behave. It creates a standard that is unattainable, and when attempted, is highly destructive to a man and his family. A man should be dimwitted, slow, and overall uninterested. They are merely pawns in their wives overall agenda. This stereotype gave life to the “happy wife, happy life” mentality. This, more often than stereotype #1, is also found in movies and television. We all love that tv show that depicts the husband/father as a loveable moron who never gets anything right while cowering to his wife's authority. This too, is destructive and creates a culture of men who are doormats, whose only purpose is to be walked all over. What about, “Happy Spouse, Happy House”. Let’s change it. I feel that both of these stereotypes, along with other things, contribute to men’s health issues. Whether it’s the unattainable and destructive “Be a Man” stereotype, that fosters a culture of men who are unable to express themselves, feel that they are not allowed to fail, and their “manhood” is at stake if they reach out for help; or the dimwit who is not allowed to have an opinion, can never get anything right, and is only kept around for comic relief. Either way, there is something missing here. Let’s break the mold. It takes courage to reach out, it takes courage to feel your feelings, it takes courage to express yourself. You don’t have to drink beer, build things with your bare hands, wrestle alligators and watch the NFL to be “manly”. You can drink strawberry daiquiris, listen to sad music, cry during Romantic Comedies, love a nice cup of earl gray tea, and love scrapbooking and still be “manly”. Let’s create a culture of openness, emotional intelligence, self-awareness, and fearlessness when it comes to expressing ourselves with one another. Men are dying too young, and we are raising them to believe that these are the only options they have. Men, we need each other. We need community, and we need safe places to express ourselves. I’ve sat in rooms with the most courageous men I’ve ever met. I don’t mean that they stared down a lion until it cowered in fear; but instead, they stared down their emotions, addressed them, and expressed them without fear of being viewed as less of a man for doing so. I’m not even beginning to scratch the surface with this issue, and I don’t claim to have any of the answers. Men are reportedly happy to help someone reaching out to them for help, but find that they are much less likely to reach out for help themselves. If you feel inclined to share your story of hope, Jade Bloom would love to hear it. Share your story and tag us on either Instagram or Facebook with the hashtag #menofjadebloom and let’s add another H to Jade Bloom’s tagline: “Health, Healing, Happiness & Hope”. If you or someone you know is struggling with depression and suicidal thoughts, I urge you to reach out. Whether it’s to your spouse, your friends, your church, or to a suicide hotline, you need to know that you are acceptable, loved, and worth more than you could ever imagine.